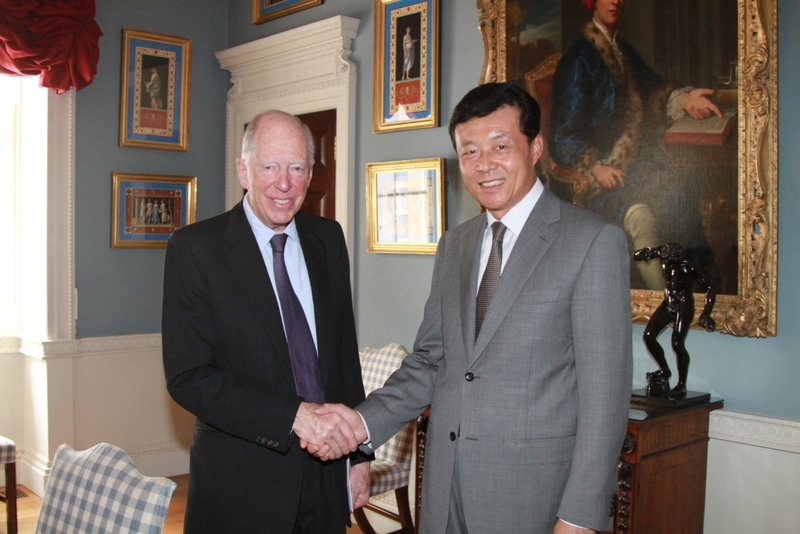 On 5 July, Ambassador Liu Xiaoming met with Lord Rothschild, a famous British financier and RIT Chairman. Lord Rothschild said that with its rapid economic development, China is playing an increasingly important role in international financial sector. The British financial community attaches great importance to the Chinese market, which RIT is actively exploring. He would soon pay his first visit to China. He hoped that this visit would further promote the company's financial cooperation with China. Ambassador Liu said that the financial services sector is an important area of China-UK cooperation, and the two countries have conducted fruitful cooperation in this field. He hoped that as a world renowned financier, Lord Rothschild would continue to play an active role in promoting the China-UK financial cooperation. Ambassador Liu wished Lord Rothschild's China visit a success. Ambassador Liu and Lord Rothschild also exchanged views on world economic outlook and other topics. Lord Rothschild was born to a famous financial family. RIT is an investment trust he established in 1988. Listed in the London Stock Exchange, the company mainly engages in investment in listed securities and special situation stocks, as well as acquisition, merger, listing and other investment banking business.